A Kids’ Guide to Manners teaches the most useful manners that kids need to feel capable and confident in any situation. Today’s kids need a fresh approach to manners that resonates with them. A Kids’ Guide to Manners goes beyond saying please and thank you with fun, practical lessons that bring manners into the modern world. From meeting new people to being a courteous guest to texting a group of friends, kids will have fun as they learn to use manners in a way that will make their lives easier and more enjoyable. 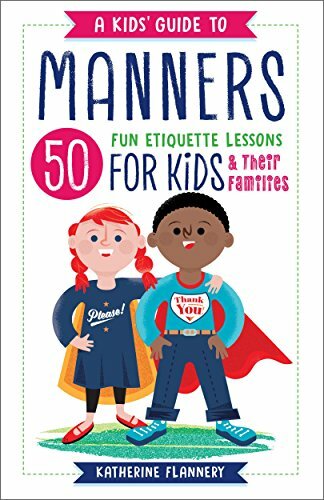 With 50 essential manners, plus interactive quizzes, entertaining examples, and at-home practice exercises, A Kids’ Guide to Manners teaches kids where, when, and how to use manners as they relate to everyday life. Build good communication skills that will make it easy to get along with others, such as constructive ways to express emotions to the power of writing a thank you note. Feel confident in new situations by knowing what to do and say when meeting new people, dining in a more formal environment, or dealing with conflict and gossip. Learn proper tech-etiquette that represents their best self over text, email, social media, as well as tips for knowing when it is or isn’t appropriate to be using technology. With A Kids’ Guide to Manners, both boys and girls will understand why manners matter and feel better than ever showing off their new social skills to everyone they know!